• Artsy, Avishay, “An Artist And Father Explores The Idea of Sharing”, KCRW radio (based in Los Angeles, CA). Joel Tauber discusses The Sharing Project with Avishay Artsy in a 4-minute story that aired on June 19, 2015. • The Sharing Project on “Triad Arts With David Ford”, WFDD radio (based in Winston-Salem, NC). Joel Tauber discusses The Sharing Project with David Ford in a 4-minute story on November 25, 2013 and a 19-minute story on November 29, 2013; December 1, 2013; August 1, 2014; and August 3, 2014. • Wood, Larry, “Filmmaker Relates Ideas About Sharing Through Happyville, A Long-Forgotten Aiken County Commune”, Aiken Standard, July 30, 2018. • Wood, Larry, “Museum Reception To Feature Video About Happyville”, Aiken Standard, July 27, 2018. • De Llano, Pedro, “Happyville In The Rearview: A Conversation Between Joel Tauber And Pedro de Llano”, Art Journal Open, October 6, 2016. • Calder, Diane, “Continued And Recommended: Joel Tauber, The Sharing Project, CSU Long Beach”, ArtScene Magazine: The Monthly Digest to Art in Southern California, Vol.34, No 11, July / August 2015, pg. 24. • “Gallery Corner”, Long Beach Business Journal, June 23 – July 6, 2015, pg. 38. • Artsy, Avishay, “A Jewish Commune And Lessons Of Sharing”, Intentional Communities Desk, June 21, 2015. • Artsy, Avishay, “A Jewish Commune And Lessons Of Sharing”, Jewish Journal, June 19, 2015. • Morris, Asia, “University Art Museum Opens Doors To Summer Exhibitions For The First Time In Years”, Long Beach Post, June 16, 2015. • Dulaney, Josh, “University Art Museum At Cal State Long Beach To Be Open For The Summer”, Long Beach Press-Telegram, June 15, 2015. 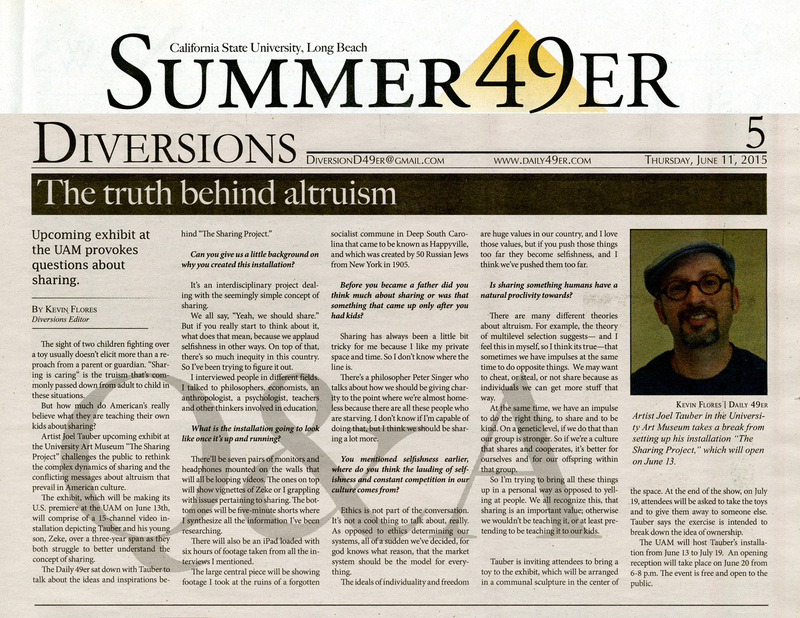 • Flores, Kevin, “New Art Exhibit Seeks The Truth Behind Altruism”, California State University, Long Beach Daily 49er, June 12, 2015. • “Joel Tauber”, zitty Berlin: Das Stadtmagazin Fur 14 Tage Und Nachte, Issue 2015/10. • Hughes, Haley, “Man To Explore Forgotten Aiken Community In Film”, Aiken Standard, July 28. 2013. 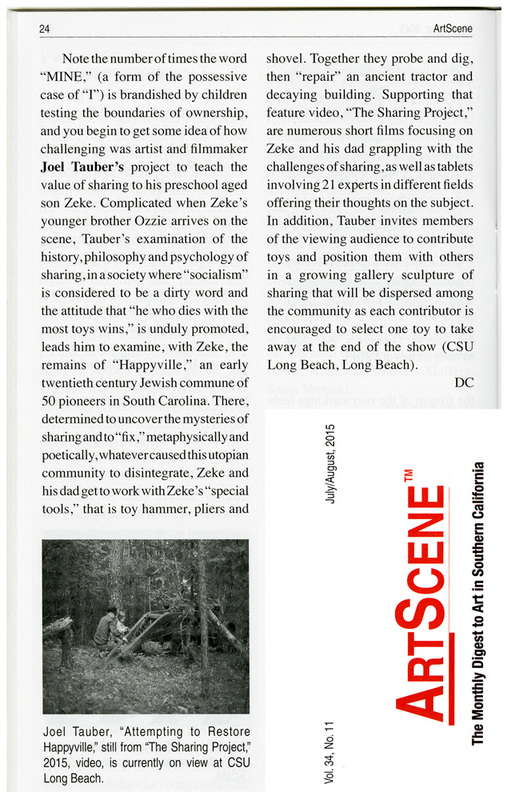 This entry was posted in Media and tagged aiken standard, ArtScene, Daily 49er, Intentional Communities Desk, Jewish Journal, Joel Tauber, KCRW, Long Beach Business Journal, Long Beach Post, Long Beach Press Telegram, media, the sharing project, WFDD, zitty Berlin Magazine on September 16, 2015 by Joel Tauber.